Electrode Control: The "how" and the "why"
Don't worry too much about how your welds look at first. * While improving electrode control you'll learn more about different job situations. * Plus WHY it's important. * Whether you swing a golf club or a bat, if you don't practice in correct ways, the results can be at least EMBARRASSING! I've talked on other pages about arc pressure and gravity. 1) Arc pressure is produced by the voltage from the machine as it's pushing the molten metal outward. 2) The pressure will vary depending on machine settings, rod size, & how much arc gap. Gravity not only effects the direction that the molten metal is coming out, but also it's going to try to make your puddle drip out. 3) If you're arc welding in a flat position, you mainly just worry about keeping the rod at right angles to the work-pieces & tilted away from the puddle to help control the puddle & the slag. 4) If you're going to weld in a vertical position, you need to aim the arc up-ward to pre-heat the metal & to help keep the puddle from dripping down. 5) At the same time, you no longer need to worry about slag because gravity is keeping it out of the way. 6) For horizontal positions it's a lot the same. Gravity will try to drip the weld so you aim the arc up-ward. 7) And then for overhead jobs you keep the rod nearly straight up for the same reasons. You don't want to do any weaving in overhead welding, just use straight "stringer" beads. 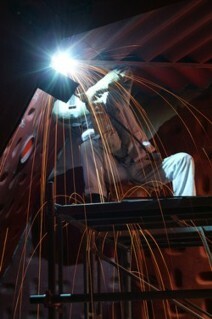 Electrode control, controls the whole welding job! 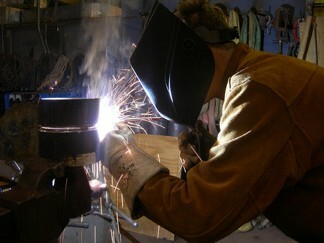 Photo by: "Jakesmome at flickr.com"
If you're at the TOP of a job it's still "flat welding". 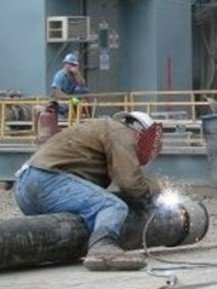 Pipe welding is rather unique in that it involves all positions as you go around it. You will get real electrode control experience in pipe welding! Photo by: " Elisfanclub at flickr.com"
Horizontal welding on pipe can be tricky too, because you need to keep changing the rod angle as you go around it. 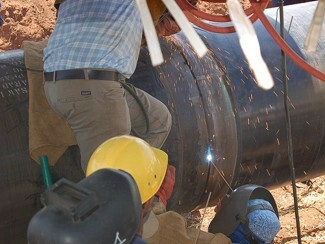 Photo by: "Taras Kalapun at flickr.com"
Here's the vertical part of welding on pipe. Photo by "Dana + Leroy at flickr.com"
Save overhead welding practice for last. Get used to ELECTRODE CONTROL & amp settings in the easier positions first. * Learn to keep the arc length as steady as possible, plus keep the rod angle, and weld in as straight a line as you can. This helps give you good LOOKS & STRENGTH. * Use both hands to steady the rod. Either both on the rod holder or one on the rod itself until it gets too short (or too hot). * Work on a steady speed to keep a uniform puddle shape. An oval shape is good but not too pointed. A round shape may be too wide, unless you need a wider/heavier bead for the job you're doing. You'll soon judge when it's right for the job size & situation. * Getting a good amperage setting for the job at hand will simply enable you to concentrate on getting a good weld & not be fighting "rod sticking" or "burn-throughs"! Go here for more about "finishing and stopping"
Want MORE INFO about controlling electrodes? Get it from my ebook, "The Arc And Beyond"!